The current load shedding situation got me thinking about alternative power and the solution I have decided on after many hours of research was to go for is a hybrid setup, where we use solar and when that fails, the power grid and when that fails the battery backup. I thought it would be a good idea to share this project with everyone, not that you are all going to do the same hands-on project, but that you can plan a similar solution for your home or small office, with a better understanding of how it all works. The more popular power backup solutions like generators and long run UPSs are good and well, however, once the load shedding stops (and who knows when or how at this stage), the power backup solutions will sit in a dusty spot in the garage never to be used again. What I wanted to do was to cover the power outage times, but in addition to be able to generate electricity through an alternative source. Basically instead of using more power to charge the batteries when the grid was working, I wanted to use less power from the grid. I got input from many people, in fact a friend of mine had built his house to run completely off the grid and listening to him gave me many good ideas – nothing as extravagant as their setup, but enough to get me started. So I needed something I could start small and scale it up as I went. I got a quote from a very well-qualified alternative power solution provider, but the pricing, although all very fair, was way out of my budget – to give you an idea it was around R180 000. The grid is still connected, but only kicks in when your solar and batteries cannot provide electricity, and the idea is that if you produce more than what you need you can provide the main grid with electricity and they will pay you. Grid-tied systems, have to monitor the batteries, monitor the charge rate from the solar panels, monitor the power left in the batteries, switch to the grid if needed, switch from the grid to the batteries if that fails etc – so there is a lot going on, a far more complex scenario. You have no backup from Eskom, your solar system charges your batteries and those keep you running, when that fails you sit in the dark. Off grid allows for simpler systems to be used, as the inverters only have to convert the DC power to AC for your house, they do not need to worry about changing over to the grid. DC coupled are the most popular solar systems being used. The solar power charges the battery bank through a DC charge controller, which then goes through an inverter to provide the household with AC power. Whether the sun is providing enough power to drive the household goods or not, the batteries are being used. As I will mention below, the batteries only have so many charges in them, so these will have a limited lifespan. 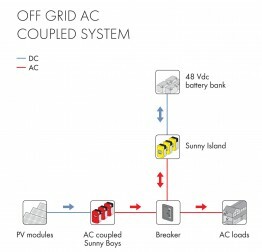 AC coupled systems, have an inverter connected to the solar panels and another connected to the battery bank. The one connected to the solar panels will supply the household with AC power while it has enough and then switch to the batteries when the sun disappears – thereby only using the batteries when absolutely needed, giving your batteries a longer lifespan. 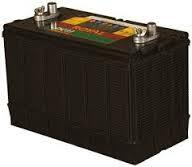 Just like your car battery has a life span of so many charges and discharges, so does the battery in these solar systems – if you are lucky and treat the batteries well, they should give you around 5 years’ service. The more expensive the battery, the longer it will last generally speaking. But I believe this battery technology will advance at a huge pace over the next 5 years, so that our next set of batteries may last double as long and hold the charge for longer as well. The above overview explanations are very broad and limited to my simplistic understanding of the complex field of power and energy. There is a whole heap more to the circuits than what I have briefly mentioned here, but I did not want to complicate the message too much. My simple thinking was that surely there must be some piece of equipment that can do most of this, without having to get so many separate specialised boxes, all just doing one simple task. The answer seems to have been Hybrid inverters. The idea is simple, connect the grid, the solar panels, the batteries, the outlet AC power cable and switch on, this system will check according to the preferences you set as to which power is to be used, how much to charge the batteries and alternate between the power sources. All for a fraction of the price of other systems. 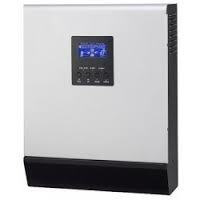 Our RCT Axpert 5000VA hybrid inverter cost us about R10500 inclusive of VAT. This seems more like it. I have bought the RCT Axpert 5000VA 48V hybrid inverter, read the manual a couple of times – it is perfectly placed on the dinning room table much to my wife’s horror! Today I fetched the batteries, I was planning on 4x 200Ah(Amp hours) 12V deep cycle batteries, but found that those were short cycle (like a car battery), so I ended up with 8x 100Ah 12V deep cycle batteries – Royal DC31 at R1568.62 including VAT each. Not in the dinning room, but in the garage. Tomorrow I will look into getting the cables to connect the batteries, so at least I will have a solution for load shedding while I wait for the solar panels (also known as PV or photovoltaic panels). You have to make sure the cables are the correct diameter otherwise they can cause a voltage drop or may over heat. The ones I could get from the battery place were too long to daisy chain the batteries. 4 in series connected in parallel to the other 4, giving me 48V at 200Ah.